Knife Purportedly Found At O.J. Simpson's Former Home Is Not Murder Weapon : The Two-Way LA detectives have determined that a knife turned in recently as possible evidence was not the weapon used to kill Simpson's ex-wife Nicole Brown Simpson and her friend Ronald Goldman in 1994. Los Angeles Police Capt. Andy Neiman announced in March that a knife possibly linked to the murder of O.J. Simpson's ex-wife was undergoing forensic tests. Those tests have determined that it was not involved in the crime. A knife said to have been found at the former estate of O.J. Simpson was not the weapon used to kill his ex-wife Nicole Brown Simpson and her friend Ronald Goldman in 1994, Los Angeles detectives have concluded. The Associated Press reports that "investigators ruled out the knife after weeks of forensic tests, Police Capt. Andy Neiman said Friday." "We have confirmed, we have determined, there is no nexus," he said according to the news service. 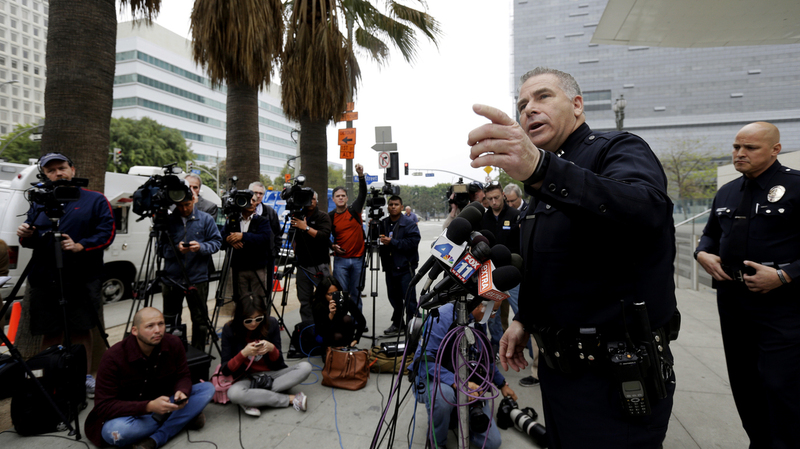 The Los Angeles Times reports that the "LAPD did extensive forensic examination of the knife for blood, fingerprints and DNA while also comparing the rusty, 5-inch fixed-blade knife with the cuts inflicted on Brown Simpson and Goldman during the deadly attack" and determined that there was no connection. The newspaper adds that "during trial testimony, the Los Angeles County coroner testified it was his opinion the weapon that killed the pair was a 6-and-half-inch blade at least." As The Two-Way previously reported, the newly tested knife had been in the possession of a former police officer until recently. "The story of the knife's origin is third-hand at best: Neiman says that [a] retired officer said that he had received it from a civilian who identified himself as a construction worker, and that the civilian said he found the weapon at the Brentwood property formerly owned by O.J. Simpson. "The dates of the alleged discovery and the transfer of the knife are not known. The house on that property has been torn down and rebuilt since the trial."